Organizers have canceled the kick off parade for the venerable Portland Rose Festival after Portland protesters promised violence against Republican Party members who planned to march in the neighborhood event. “Riseup.net” is a domain often used by far left Portland protesters. 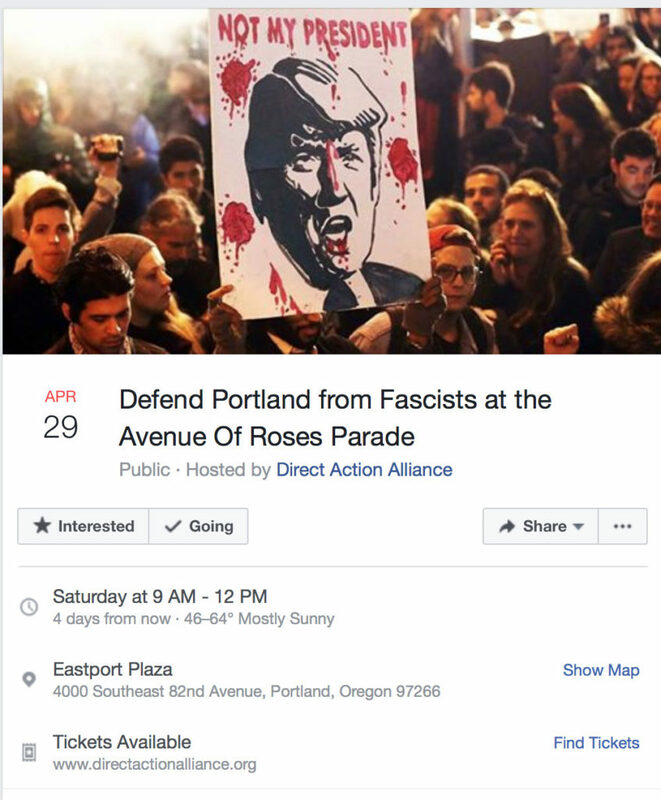 Fascists plan to march through the streets of Portland in the Avenue of Roses Parade on 82nd. The fascists know that we’ll keep shutting their marches down, they are now planning to march within other parades to protect their message of hate and white supremacy – it WON’T work. Nazis will not march through Portland. The group we’re disrupting is #67. 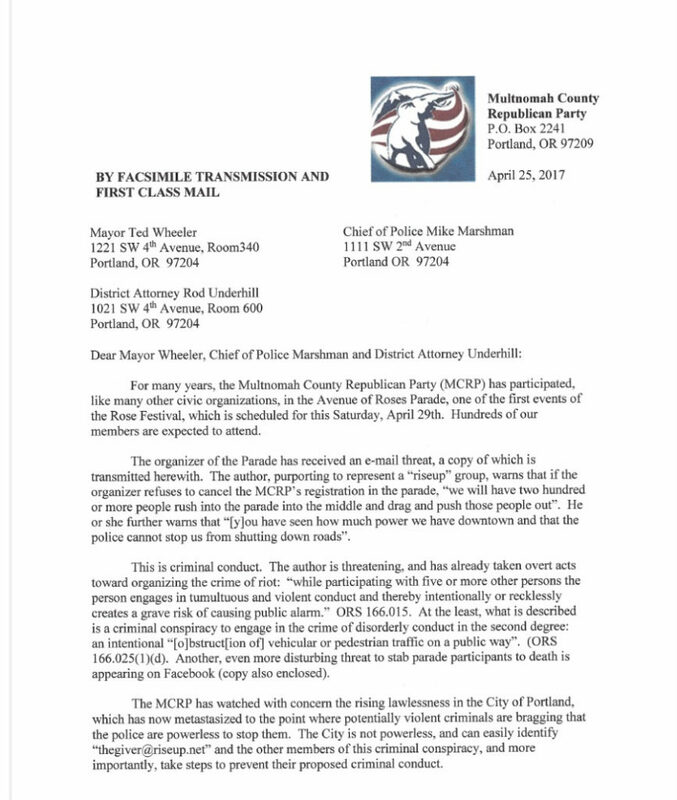 It is registered to the Multnomah County Republicans, but these infiltrators are the same folks from Lake Oswego, Salem, Vancouver, and even Berkeley. They will attempt to march from the Eastport Plaza to Yamhill, but nazis will not march through our city. This event is not in opposition to The Avenue of Roses Parade, it is against the fascists who intend to march through our neighborhoods and intimidate our marginalized communities. By now it’s obvious that “fascists” are people who don’t agree with them. According to online reports there’s one person who is believed to be behind the terroristic threats. “This is criminal conduct. The author is threatening, and has already taken overt acts toward organizing the crime of riot: “while participating with five or more other persons the person engages in tumultuous and violent conduct and thereby intentionally or recklessly creates a grave risk of causing public alarm.” ORS 166.015. At the least what is described is a criminal conspiracy to engage in the crime of disorderly conduct in the second degree…. That’s the shot, here’s the chaser. These people who cloak themselves in kaffiyeh cloth and balaclavas are the problem. They have conspired to shut up the people with whom they don’t agree. They’re like Lois Lerner but with knives, poles and guns. We’ve seen them in Berkeley, Lake Oswego, Portland and Seattle. If this doesn’t tell you what you need to know about how dangerous and lawless Portland is and show you the nature of the political prosecution of Strickland then you are Not.Paying.Attention. Justice for Michael Strickland. You could be next. In fact, based on what just happened Tuesday, you probably are.